Product code: 189 Categories: Sold Items, Sold Jewellery. This absolutely stunning brooch was made by the Flavelle Brothers, and dates from circa 1910. The brooch is fitted with the original velvet lined box, which are quite hard to find. 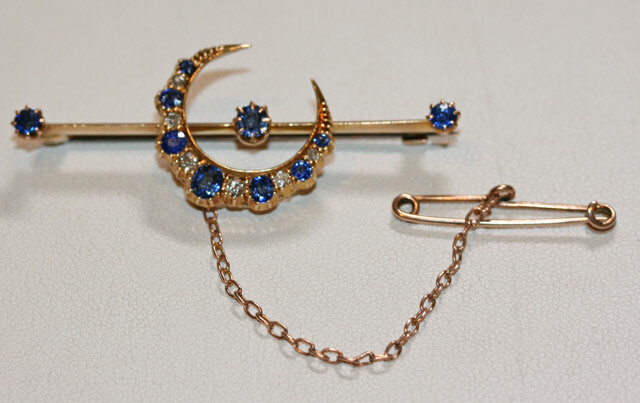 Hand made in 15ct gold, this crescent brooch is set with 10 natural sapphires totaling 1.82 carats, and 6 old European cut diamonds weighing 0.24cts. The brooch measures 5.3cm from left to right, making it a very nice size. Early Australiana is becoming very sought after, and with a piece like this, it is easy to see why.